Beatles Band-Signed Card. This vintage Top Rank Sunday Dancing Club membership card is dated January 7, 1962, in an unknown hand on the front, and signed by all four Beatles on the reverse. Paul has signed "Love/Paul McCartney" in black, George Harrison has signed in red ink, Ringo Starr in blue with a small star drawn underneath, and John Lennon in blue as well. All have added one or more X's under their respective names. 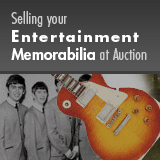 Most likely signed near the end of the band's pre-celebrity period, this is extremely desirable, since items autographed by the band after 1963 are difficult enough to find, and, after 1969, extremely scarce. The piece is in Good to Very Good condition with mild to moderate edge wear and soiling and several criss-crossing deep creases that run through the signatures. Accompanied by James Spence Authentication auction LOA.